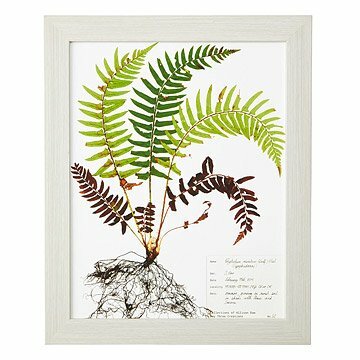 This print is made from an image of a painstakingly preserved specimen of Western Sword Fern. Inspired by the precise beauty of scientific herbarium specimens, Allison Daw created this botanical print of Western Sword Fern. Her intricate process preserves the plant's delicate, distinctive details through pressing, drying, coating, and mounting a real specimen from nature, and then reproducing this organic ideal through a high-resolution scan and archival color print. The prints showcase every part of the plant's unique structure and subtle colors, and include a detailed botanical identification in the corner. They make perfect decor for any gardener or decorator who loves the elegant intersection of science and art. Printed and framed in Portland, Oregon. For more botanical prints, check out Queen Anne's Lace, Fireweed, and Poppy. I got this for my mother-in-law for Christmas. She has a lot of ferns in her backyard and is a landscape architect, so this was perfect for her. It arrived in perfect condition and looked exactly like the photo online.